Seeing friends and family you haven't caught up with in a while may inspire you to look better, but have you picked out a nice new scent that'll make you smell memorable? Here are seven new fragrances that should get you ready for the holiday festivities! They make for great gifts, too. Lift your mood with this new scent from Mary Kay! It's a fruity scent that features red berries, sweet nectarine, and sparkling apple as the top notes. The middle notes are floral with jasmine rose, muguet, and wild honeysuckle. Finally, it dries down into a warm base of patchouli, skin musk, amber, and agarwood. This will prep you for the lunch parties that last well into the afternoon! Inspired by rare flowers, woods and spices, the Intense Collection comprises of eight new scents: Myrrh & Tonka, Orris & Sandalwood, Tuberose Angelica, Velvet Rose and Oud, Amber & Patchouli, Dark Amber & Ginger Lily, Incense & Cedrat, and Oud & Bergamot. These scents are dark, sensual, and mysterious. Jo Malone is known for creating more unusual scents so if you’re looking for a unique fragrance, check this collection out! Modern Muse Eau de Rouge is the latest flanker of the Estee Lauder Modern Muse, which was launched in 2013. It gives a more modern, youthful twist on the original, with a floral, woody fragrance that hints of fruitiness. This eau de parfum is a delightful concoction of pink pepper, rose, green notes, raspberry, currant buds, jasmine, magnolia, vanilla, ambrette, woody notes and vetiver. The soft spray of flowers is a great choice for everyday use while still smelling very feminine. One of the most popular unisex fragrances in the world presents its latest flanker in the iconic bottle, dipped luxuriously in gold. The limited edition scent is primarily woodsy, with fresh and juicy notes. It’s a complex blend of fig, bergamot, sage, neroli, jasmine, violet, vetiver, patchouli and guaiac wood. This eau de toilette will make a great present for the man in your life, plus you can "borrow" it for yourself, too! In keeping with their trademark, the newest addition from the house of Chloe is an interpretation of the most beloved flower in the world, the rose. 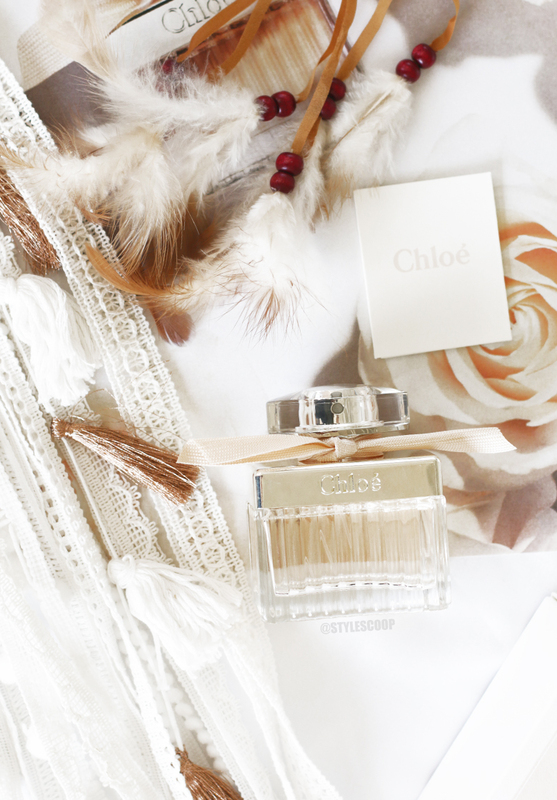 Chloe Fleur de Parfum is a vegetal floral with added notes of verbena, bergamot, grapefruit, cherry blossom, black currant, peach, rice, cedar and white musk. Floral gals will fall in love with how the rose notes are given a fresh and zesty take! After last year’s success with Marc Jacobs Decadence, which is considered to be the first mature fragrance of the brand, Marc Jacobs follows up with a lighter, brighter version. The new eau de parfum is a sensual, floral scent with notes of champagne, bergamot, orange blossom, honeysuckle, hydrangea, gardenia, iris flower, saffron, vanilla and liquid amber. Those who are looking for more grown-up florals will surely swoon! Plus, the handbag design of the bottle, complete with the tassel, will be a unique addition to your dresser. Did you buy any new scents recently? What fragrance will you be sporting over the holidays?